I just returned home from my first ever cruise and thought it was a great time to tell you some of the things I wish I had known before the cruise. 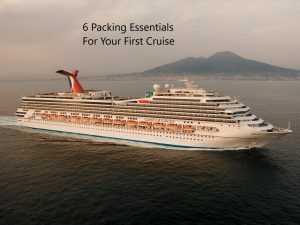 So in case it’s almost time to cruise and you are still struggling with what to pack here are my top 6 cruise essentials packing tips. It has two output USB ports (so it can charge two phones at once). The charge on the battery pack itself last for multiple phone charges so you aren’t constantly recharging the battery pack. The battery pack has a fast charge USB 3 port so you can fully recharge the battery pack fairly quickly. Disclaimer: We are a participant in the Amazon Services LLC Associates Program, an affiliate advertising program designed to provide a means for us to earn fees by linking to Amazon.com and affiliated sites. This program results in no added costs for you. Pack at least one backpack with things you will need right away, a swim suit, sunscreen, and sunglasses. It may be a while after boarding before your room is ready and even longer before you get your luggage. If you pack your pool essentials you will be able to enjoy some pool time while everyone else is boarding, waiting on their rooms, and waiting on their luggage. Pack a second backpack with the documents you will need to get onboard – especially your families boarding passes and passports. Arrange for your other luggage to be delivered to your room, but carry on your two backpacks. Pack a sweater, sweatshirt, or light jacket for everyone. It can get chilly on deck after dark. There are also rooms on the ship that might be cool enough for a light jacket or sweater. Pack coordinating outfits for dinner, keeping in mind there will be photographs taken around dinner time each night. If the families outfits coordinate it will be much easier to select backgrounds that work well with what you are wearing. Each cruise has at least one formal night where more formal attire is required for the main dining room. However, that doesn’t mean you can’t dress up for dinner more often if you would like. It also doesn’t mean that you have to have dinner in the main dining room on formal night if you really don’t want to dress up. Our family dressed in suits and dresses for formal night and one other night the guys wore dress pants and shirts and ties, and the girls wore dresses. We ended up with lots of great family pictures. Pack Dramamine or some type of motion sickness medicine. You probably won’t need it, but it’s nice to have just in case! Pack a beach bag that you can use for excursions or beach or pool time and that can also double as an extra bag in case you purchase items either on the ship or at Port. And finally, one item you do not need to pack is beach towels. Unless you are planning a visit to the beach either before or after your cruise, you will not need to pack beach towels. There will be plenty on the ship. We were given 1 towel for each person in our cabin and we were able to exchange them at the pool any time we needed clean or dry towels. Any pool towels left in the room were also exchanged for clean ones when the room was cleaned. Coming soon a post on tips for your first cruise.